VISIT THE WONDERFUL ARCHAEOLOGICAL SITE OF TULUM AND SNORKEL IN THE CRYSTAL CLEAR WATER OF A CENOTE! Enjoy this private tour to tulum and visit the archaeological site with your own personal guide and private transportation. In the Private Tulum Tour our guides possess the right skills and know everything about this beautiful historical site and are happy to guide you around! 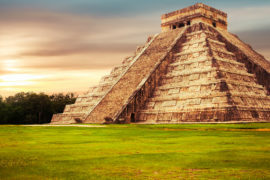 The guide will show you Tulum, which was built during the dying days of the Mayan Empire and was actually a fort. This fort was the only one next to the sea! Not only do we visit this amazing site of Tulum, we will also give you the amazing opportunity to snorkel in a cenote, the Mayan underwater world. Pick up at your hotel with private transportation. Visit to the archaeological site of Tulum, where your own personal guide will be talking about the history of this great Mayan civilization. After this, you will have some free time to explore this impressive site yourself. This is also a great opportunity to take some photos. Snorkeling in the crystal clear waters of a cenote. Lunch time at Don Cafeto or Mezzanine in Tulum.